â€œAfter these things God tested Abraham and said to him, â€œAbraham!â€ And he said, â€œHere I am.â€ 2Â He said, â€œTake your son, your only son Isaac, whom you love, and go to the land of Moriah, and offer him there as a burnt offering on one of the mountains of which I shall tell you. . . . . 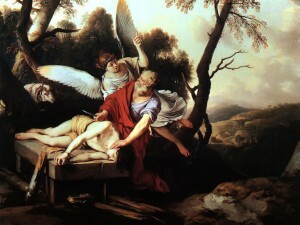 In the story of Abraham being tested by sacrificing his only son Isaac we get see a heart- wrenching story. Abraham who has not had a child his entire adult life, and it is only when he is old that God blesses he and his wife Sara with a boy. They had endured the cultural shame of having no children. Now God had promised to give them a child, and he had finally arrived. We see from the text that Isaac is old enough to carry a load of wood for the sacrifice, and was very much aware of how such a time of worship would go, and what was required to offer it. He asks along the way, â€œBehold, the fire and the wood, but where is the lamb for a burnt offering?â€ He would have undoubtedly experienced many such times of sacrifice. The story takes place in the context of a worship service and it was to take place at a given location. But, what transpires there is not â€œLord I lift you name on high,â€ or any other lighthearted song sung half-heartedly. During this time, Isaac was asked to kill his son. If Isaac had become an idol to Abraham â€“ or had Abraham put Isaac before the Lord, we really donâ€™t know. But, what if this is how our times of worship are really supposed to be? What if they are supposed to be deeply personal, and extremely moving? What if God says, â€œI donâ€™t want your puny left over offering, I want your children.â€ What if God says, â€œI donâ€™t want what you had planned on bringing to the worship service, instead I want that which is most precious to you.â€ What if he tells us ahead of the worship service what the offering should be, and the act of worship is bringing it to the alter â€“ where you leave it? Instead of thinking of worship as a place to go to get â€œfed, fueled, encouraged, excited, etcâ€ or any other completely self-focused objectives, what if we are to learn how worship should be from this passage? What is worship is supposed to be heart-wrenching and truly sacrificial? This is not exciting. A time of worship where our faith is truly tested is not enjoyable. It is quite miserable. What if worship is where we stand before our God and he painfully extracts the sin in our lives. This is not done with a cup of coffee in the hand. True worship, based on this story, leaves the follower of God truly and deeply joyful that there was a substitute given. This kind of worship leaves the worshipper caring less where they go for lunch after the service. They may even sit and weep because God has given His one and only Son for them (and their family). At Abrahamâ€™s worship service there was deep, deep, deep sense of thankfulness. How long did Abraham hug his son after it was all over; a moment, an hour? Did they weep together? Notice that God does not rip Isaac from Abraham’s arms. Abraham as to bring Isaac to the alter and lay him on it. We learn to lay down that which is most precious to use, to put God first, and he in His grace provides what we need to worship Him. Praise God for the ram caught in the thicket. It would be a very risky prayer to ask God to give you this type of worship service. But what we see is Godâ€™s love for Abraham. God had a very big plan for this this man, he was to be a blessing to the entire world, and he would not allow anything (or anyone) to get in between Him and his precious child. If you are His child, he loves you with this same jealous love. He will not allow anything to get in-between you and Him. He simply loves you too much to see you caught up in sin. We are to sacrifice that which means the most to us, so that others may be blessed. Jesus laid down his one and only Son so that all of creation would be restored. God asks the same of Jesusâ€™ followers. 1 John 3;16 â€œBy this we know love, that he laid down his life for us, and we ought to lay down our lives for the brothers.â€ We give and sacrifice to maintain a right relationship with the Father, and he uses that faithfulness and righteousness to bless the world around us. Pray for your worship service to be truly worshipful (but know this is a costly and dangerous prayer).